To post an event, contact Laurie Silverstein. Bring supplies or purchase (about $43) at first class. This type of woodblock printing originated during the early 20th century in Provincetown, MA, from a community of artists seeking to emulate Japanese prints using only one woodblock. The process involves carving an image into white pine and painting one small section at a time with watercolor, which results in a multi-colored woodblock print without multiple registrations for color. The most well-known practitioner of this distinctly American art form (also called “the Provincetown Print”) was Blanche Lazzell. Students will learn to transfer their image onto wood, carve and proof the image, and paint as many unique prints as time allows. Minimum enrollment needed to run each program, so please register early! 1. Introduction to the Provincetown Print. 2. Learn to abstract their image into a form that will adapt to this woodblock technique and transfer it onto wood. 3. Learn to carve the woodblock, using X-acto knives. 4. Proof and refine carved image before painting. Check their website for tuition and supply lists. Create various projects using calligraphy & other artistic techniques. 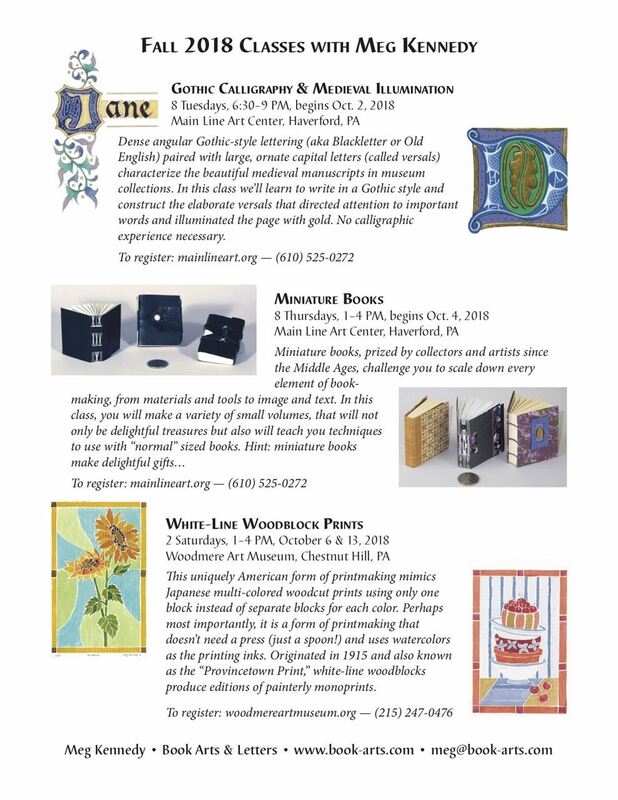 Maureen Peters of the Philadelphia Calligraphers Society will teach these workshops. Some materials will be supplied. No prior experience is necessary. This program is free and open to adults 18 and older. Registration is required. Call 856-629-1212 x206. Course Description: Uncial calligraphy is more than 2,000 years old yet looks surprisingly modern and fresh. Its voluptuous, elegant letterforms make it a unique fit for hand-lettered greetings, short … (read more...)quotes, titling/headlines, and tee-shirt designs. Additionally, Uncial is the perfect “hand” for the beginning calligraphy student, and makes a good jumping-off point for learning other calligraphy styles. In this two-part class you’ll use a broad-edge marker to explore this easy-to-learn style. We’ll start with basic strokes then build upon them to create beautiful letterforms. We’ll also cover spacing and some basic layout. Throughout the class you’ll learn about calligraphy tools and materials, and view examples of Uncial and other styles of calligraphy. Through playful pen exercises you’ll gain strong lettering skills as well as confidence in your ability to continue with this timeless art form. You’ll also complete a small finished piece that will be suitable for framing or card making. No previous experience is necessary to participate! Please bring the following items to class: Legal pad (white); Pencil; White eraser; Ruler (12”-18”); Paper clips (just a few); Color pencils of your choice (instructor will have some to share if you don’t already have some). Optional items: Notebook and Pen.